Probably the first thing after a failure is to get a readout of the Diagnostic Trouble Codes stored in the EV-ECU, either at a dealer using the MUT3 or using a clone device such as the i909 from iCarSoft. If you can get those codes then we can help to give some idea of which circuits to look at in the box. The EV-ECU stores the DTCs that can be read over the CAN buss thru the OBDII port by the MUT3 or a clone. Last edited by kiev on Sun Sep 02, 2018 8:21 am, edited 1 time in total. Found the culprit- a popped disc capacitor. While packing my failed charger for shipping to Kiev, I took a look under the top circuit board and found the culprit, or at least one of them. One of the two blue disc capacitors on the lower board, with about half of the disc sticking up out of the black potting compound is completely popped apart. The two big white resistors still appear fine, bright white without cracking or browning. The blue caps in the doghouse surrounded by the black conformal coating. It sounds like you have done quite a bit of research to getting this fixed. The CAN buss probably controls the functioning of the box so that may hinder testing, but the spare pack and 12V is a good idea. There is also the 1 khz pwm handshake signal thru the level 1 charge port to consider. Supposedly the charger box is not VIN coded, so maybe it could be piggy-back connected to your car's CAN and come on, but the system is probably too integrated for that to work. 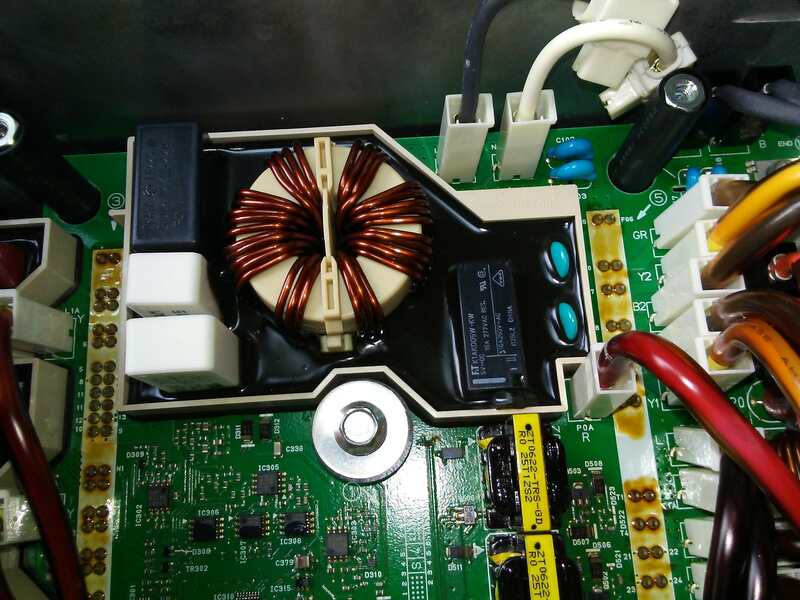 Something has to trigger the AC input relay and then it would need PFC voltage and current control, as well as charger output voltage and current control. i think it would be a good idea for you to post up about this PM, your charger issue, testing, repairs, status, etc. You could either start a new one dedicated to your situation or put it in the charger troubleshooting thread. Before taking the charger out of the car, I took the lid off, and "hindged the top PCB over so I could look at the parts in the doghouse. I see there must be two versions, as I have seen one version with two blue thru hole caps, and another version with a vertical small pcb with SMD Caps on it. The version we have has the SMD CAPs on it. I saw on the previous thread that someone found the part markings for the caps, and came up with murata part numbers. The charger just got removed from the car, and I will be picking it up tomorrow so I can continue working on it. I can use the chopstick method of removing the potting so I can see if resistors are also blown. The 20amp fuse in the Inverter is also blown, so that is why both the AC charger and the DC-DC Functions are both not working. Since the caps were blown away, at this stage I do not know if anything else is shorted to cause the 20 amp fuse to blow. After I fix all the problems with the components in the doghouse, I probably will need to remove the board it is attached to so I can get down to the heatsink and see if any of the MOSFETs are shorted. I saw someone say that all of the solder connections along the two white strips need to be desoldered before the PCB Can be removed from the box. I think all of the solder points along the white strips are actually the leads from the MOSFETS. So it might be able to check the MOSFETS without completely removing the PCB. Another thought I had, was that the reason it was thought that all the solder connections had to be desoldered to remove the PCB, was because the MOSFETs are fixed to the Heatsink, but the Heatsink is probably just fitted to the cooling tank with heatsink compound, causing a seal that is hard to break. This is pressured down with the PCB is pulled down when the screws in the standoffs are tightened down. Yes I am familair with the hack to apply 12v to the pin on the QC Relay to fource the contacts to close and allow use of the Chademo port. I've built two "Electric Jerry cans" that I put inside the cargo area, and use a TDK 48V to 360v DC-DC Converter fed through the Chademo port to charge the traction battery. This allows charging from the Jerry cans, even while driving. It should be noted that this method can only be used when the car is in the "READY" state, so the car thinks the charging current comming in is the same as regenerative braking and the BMU Calculates the charge as such. I wonder if the 20amp fuse blew just because a power surge happened, or if there is actual MOSFET Damage causing a short that blew the fuse. I have a spare battery pack that was removed from another car, that I can use as a load. I don't know if the charger will function in a dumb mode if only 240VAC is applied to the ac input, HV output is connected to my test battery, and a 12v battery is connected to the DC-DC Output. I don't know if it will work with the CANBUS Connector not connected to anything, so would it power up and just power down because of no canbus communications? This would be a great way to test everything before trying to put it back in the car. I'll let you know what I find out when I get the unit on the bench. Look forward to more info from you, and I might cut and paste this PM Back to the thread if ok? Sorry to hear about the failed chargers over there in WA, but hopefully we can find a solution, especially since coulomb (Mike) in Sydney is alert to the problem. He and i have worked over several years on troubleshooting and repair of diy EV chargers. One of the forum members has sent me his broken charger and it will be here next week. i should be able to give you an answer about repairs after i get it and clean out the doghouse. As far as options, i think there may be two using an aftermarket charger such as from TCCH or Lear, depending upon whether or not the car has a Chademo port for Level 3 charging. With chademo, the charger output could be connected thru the port sockets to the pack by switching on the main contactors using the dcqc relay which is located under the rear seat. Without chademo, the charger output could be routed to the pack at the terminals located within the motor control unit and switching on the main contactors using the key switch to READY. What is your level of comfort with handling electrical stuff? Have you pulled the charger cover to inspect for scorching or burned components? Hi Kiev: I saw a discussion you had with Electronpusher in regards to repairing the charger/DC-DC Converter. Seems there are quite a few of these with the resistor and caps blown up in the "doghouse" potted section on the charger. Do you know if anyone has been able to replace these components and get a unit back up and running? Do you know if in addition to these parts, was anything else found faulty? There are two people here in Perth area with blown chargers so we are looking at what options and any updates on what can be done. Last edited by skylogger on Sun Jul 15, 2018 7:29 am, edited 1 time in total. I've been able to remove the main AC Charger board out of the box. One earlier comment in this thread from another person stated that all of the solder joints along the two white strips had to be desoldered to get the PCB out of the box. This is not correct. I fist labeled and unplugged all the wires.quick disconnect connectors. I removed the big central screw and bushing. I tried slightly prying on several edges of the board thinking it had to break the seal of the heatsink compount between the heatsink and the box. It did not look like the four standoffs had to be removed, as the holes in the PCB are larger than the standoffs and it looks like the standoffs go through the PCB without making contact. corner standoffs and the central screw and bushing that mount the whole assembly to the box. I have scraped away the rubber potting inside the doghouse, and I found in my version, there is a small vertical PCB that emulates what was two thru hole caps C121 and C122 on the previous version. Some of these SMD Caps are blown away and there is a little track damage on the small vertical daughter pcb, So I plan to unsolder the PCB and replace it with the same two Thru hole caps that were in the original version. These are 2kv voltage rated caps and the value was noted earlier in this thread with someone decoding the murata part number found on one of the caps. If you look along the edge of the PCB between the PCB and the heatsink, you can see that all of the pins from the Power devices have been bent in a dog leg so they come out from the device as 0.2" and mount to the PCB holes as 0.1" between pins. I've used an ohm meter to check across several pairs of these PCB pads, and found quite a few measure 0R and some others measure around 200R. Unless there are several different types of devices, this looks like maybe some of these devices have gone shorted. So at this stage, it looks like I will need to desolder all the pads along the two white strips anyway, so I can remove the heatsink and power devices from the PCB. Up inside the heatsink toward the PCB side, it looks like the power devices have been potted with the same rubber potting material that the doghouse used, so it will probably take me quite a few hours to do all the desoldering, and potting removal to get down to the power devices. I had a quick go at attaching a photo but it did not work. I'll have to get someone to tell me how to upload images direct, or find a share site that images can be uploaded to and URL Linked to. thanks skylogger for the information about removing the bottom board. i've updated the first post to add links to charger issues. and edited my posts to remove mention of desoldering for board removal. i use a free hosting site, imgur.com, for my pictures. They provide "get share links" for posting to forums which resize the photos to fit the page width. Just copy and paste the BBCode forum link from imgur into your message. SMD caps on the daughter board and the damaged tracks. The daughter board is fitted with four pins that go to the orignal C121 and C122 Thru hole cap locations. I plan to desolder the daughter board from the pins, and then use the older style thru hole caps and solder to their original positions. Okay i can click and see the picture. But to make it show on the forum, you need to use the "Share Links". In the upper right hand corner of the picture while you are on imgur, there will be a pull-down menu, or it may show up to the right hand side of the picture if you click on the thumbnail of it while in your account. Here's what i see when i click on the thumbnail and it enlarges to show the share links on the rh side. And here is the other method using the pulldown arrow. When you click on 'get share links' a popup box will appear in the middle of the screen with the various types. Click on the Copy button for the BBC forums, then paste it where you want it to appear in your message. p.s. Good job on getting the board out and scrapping off the coating. p.p.s. Current Sense Resistor R232, 8L00 = 8.00 mOhm 1%, is showing a bit of thermal scorching. Last edited by kiev on Sun Jul 22, 2018 6:57 am, edited 2 times in total.